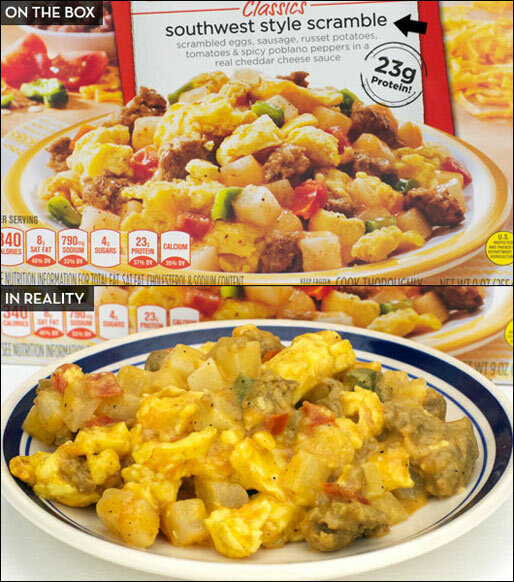 I tried three varieties of Stouffer's Morning Classics Scrambles: 1) Bacon & Egg Scramble; 2) Sausage & Egg Scramble; and 3) Southwest Style Scramble. All three products were generally quite tasty, very filling and looked vaguely like the images on their packaging. It's nice that the end product doesn't have a watery residue as similar microwave products often have. 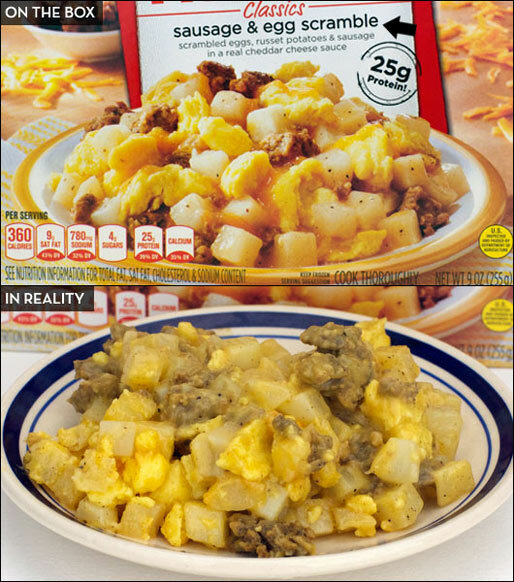 The largest negative of the products is that the potatoes felt slightly undercooked. IMPORTANT NOTE: The products are very, very hot when they're done being microwaved. Be sure to let them set in the microwave for at least 1 minute before removing the film and handling the package. My favorite of the Morning Classics was the bacon and egg version. The bacon tastes fine, but the standout flavor is cheese. All three varieties could be described as cheesy, but in this product, the cheese has a starring role. More than the others, this variety had a feeling of being like a unique take on corned beef hash. The dish is playfully salty, without being overpowering. Nearly tied for first place was the southwest style scramble. To get the best out of this one, stir it and let it set for an additional 2 minutes. Once it sets, the flavors meld together. If you eat it right away, the peppers and sausage don't feel integrated into the whole. This scramble has a respectable amount of spicy heat. If you love Mexican food, this will probably be your favorite of the three. In last place, it's the sausage and egg scramble. It’s not bad. It's just that no flavors really stand out. Of the three, this tasted most like a microwave product with the sausage having a slightly spongy texture that's all too common in microwave breakfast items. In the southwest version, there's more going on in terms of flavor and taste so you don't notice the trouble with the sausage. In the sausage and egg version, the sausage stands out, making its shortcomings more noticeable. The cooking process is the same for all three products. Microwave on high 3 minutes. Stir. Microwave 90 more seconds. 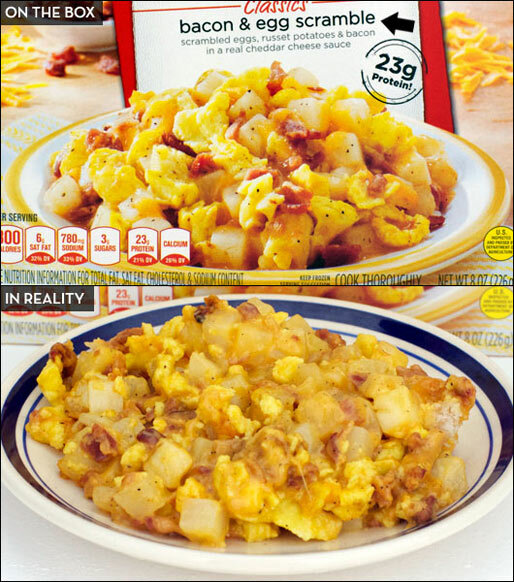 Final Verdict: When compared to other microwave breakfast products, these are quite good. When compared to homemade scrambles, they don't compare. I give this product a score of 4.5 which I will round up to a 5. 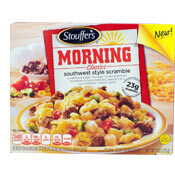 What do you think of Stouffer’s Morning Classics Scrambles? The comment haven't been good. I usually eat Jimmy Dean. I take out of freezer and put in fridge the night before, and find that it cooks better. I cut down on cooking time and nothing is overcooked. I do that with Stouffer's meals for one. You can change cooking directions.I always let a meal set for 5 minutes before eating. I've only found and tried the sausage and egg scramble. It is utterly disgusting. The only flavors there are black pepper and sage, and way too much of both. They'd do better replacing their awful cheese sauce with a white gravy and lay off the pepper. I tried all three. Don't be fooled by the names. While they might be called "bacon and egg scramble", etc... Potatoes are by far the most prevalent ingredient. The sauces are overpowering; and as others have mentioned the potatoes are under cooked. Personally, I struggled to finish these slimy meals. Love the southwest scramble, but unable to find in grocery stores in Columbia, SC. Who sells it now? I made the Sausage & Egg Scramble variety and it was utterly repugnant. The flavor was just gross, like overbearing fennel or something. The eggs tasted artificial and the sausage was gross and spongy. I think most of the gross flavor was in the sausage. Never again. Good stuff. Fast to make good for on-the-go people. Throw some Cholula on the southwestern kind for extra kick! The Bacon & Egg scramble was GROSS. I bought four and now I don't know what to do with the other three. I hate to waste money and this was a waste. I like the bacon one, but I wish they would use better cuts of turkey bacon. I've gotten a few where all the bacon pieces were nothing but fat. I don't care for the other two varieties at all. The sausage one tastes like a bowl full of seasonings and the southwest one is kind of bland. My husband tried the one with bacon did not like it. TOO FATTY. Could not finish it. Gross, gross, gross. The sausage and egg one literally smelled like vomit cooking. Masked with overbearing pepper to cover up the raw bland taste. I tried the sausage one and the taste was so awful I couldn't even finish it. I even removed all of the sausage but the entire bowl just tasted like rotten sausage. I also tried the bacon one and it was tolerable. No where near as good as the Jimmy Dean breakfast bowls. The bacon, egg and cheese scramble has no flavor of any of those ingredients. The only taste comes from some disgusting spice. This product is awful and I won't be trying the others. 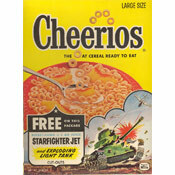 I just had the Southwest version. The picture above looks better then what came out of my oven (the micro-bake family size version). I debated if I should eat it at all, but I don't like to waste food and it smelled okay. The pepper taste was good, the potatoes were underdone. The sausage was rather large, I've had smaller sausage chunks on a pizza. So I would rate it okay, until the after effect. I thought with that much cheese it wouldn't act like a laxative. Be careful if you don't want 24 hours of your life taken away.